It’s time for another great issue of Forbidden Gallery, a horror comics anthology presented by William Mull and his ACP Comics, and this third edition is still quite the charm. I’m reviewing this from an advance pdf file. Soon you will be able to help fund the printing of hard copies via Kickstarter. As with the previous issues, Mull has assembled a fun and frightening collection of short-form horror tales in the tradition of classic EC comics and TV anthologies like Night Gallery. 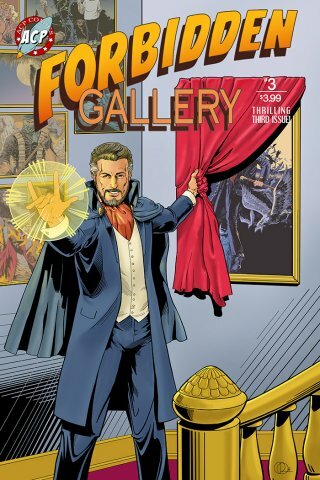 This issue also continues the wonderful combination of veteran talents with bright newcomers and creates a perfect comics experience for the Halloween season with five scary short stories , all hosted by Archimedes, the curator of the Forbidden Gallery. The spotlight is on Archimedes in the opening story, a short sketch of jealousy and ejection, written by Mull with art by Aileen Oracion. It’s a good way to set the tone for the book. 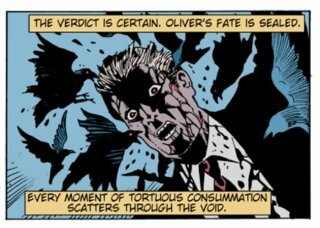 Next up is Scattercrow, in Night of the Long Talons, also written by Mull with terrific art from Karl Comendador (see a sample panel at left). This is essentially a supernatural superhero origin story, and it sets the stage for what will likely be future adventures of the avenging corvid-powered spirit of vengeance.I’m looking forward to seeing more from this character. Comics vet, Nicola Cuti, writes The Vampire’s Wand, a tale of magic and vampires that packs plenty of twists into its seven pages and still manages to surprise at the end. Nik Poliwko’s art (see a tiny sample below), which I’ve been a fan of since discovering it in The Creeps Magazine, is spectacular, and he’s quickly become a modern master of the short-form horror story. Turnabout is a story that manages to be cute and gory at the same time. This VooDoo tale of a woman scorned was written by Roger McKenzie, another veteran with impressive credits to his name, and features art by Dan Day, an artist I’ve always enjoyed from whom I have not seen work by for three decades. The story is a good quick thrill, and the art, with a bit of an underground comics vibe, perfectly matches the style of the story. 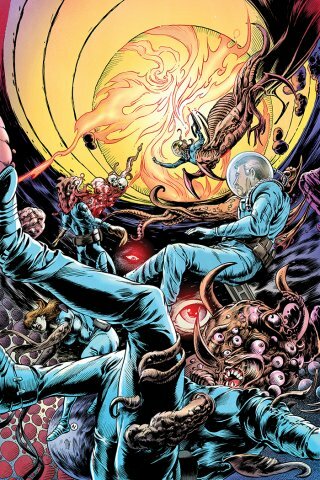 Wrapping up the stories, we have Necronauts, a horrific sci-fi tale written by Ed DeVore, from a concept by Von Grimm, with stunning artwork by the team of Portaveritas and Jeff Austin (seen left). This is a real gem of speculative fiction that tells the tales of a team of scientists who think they’ve discovered a gateway to the afterlife. As a bonus we get a couple of great back covers by Steven Butler, whose Mr. Mixit (with writer Roger McKenzie) was one of the highlights of this year’s Charlton Arrow comics. Forbidden Gallery #3 is a worthy successor to the excellent previous two issues (you can read my reviews of those HERE and HERE, and order them HERE), and I will remind you folks of this once the Kickstarter/preorder for print copies goes live, hopefully any day now.